We had excess habanero peppers at the end of the gardening season. 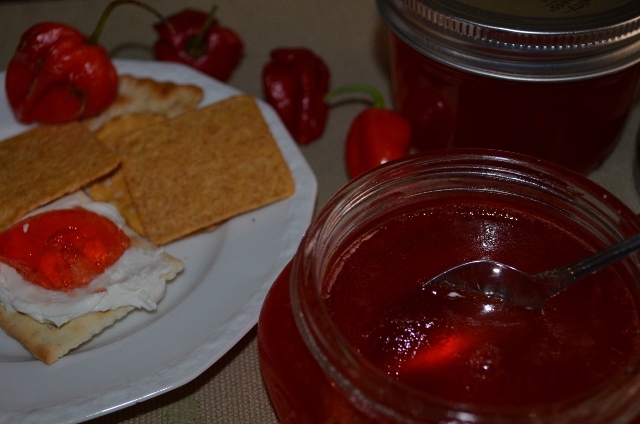 I always enjoy the taste of pepper jelly spread on a cracker with a little cream cheese so decided to make a hot version of pepper jelly with the habaneros. I used around 20 peppers which makes a hot jelly but you can use fewer for a jelly with less kick. 2. Remove stems, seeds and membranes from bell peppers and habaneros. 3. Put bell peppers, habaneros and vinegar in a blender and process until smooth. 4. Combine pepper-vinegar puree and all the sugar in a large pan. 5. Bring to a boil and reduce heat to a simmer; cook 20 minutes. 6. Remove from heat and strain through a jelly or cheesecloth. Pour liquid in large pan. 7. Return to heat and bring to a boil. Add liquid pectin and cook at full rolling boil for one minute. 8. Remove from heat, skim foam if desired, and ladle into prepared jars. Wipe tops of jars with damp clean cloth and seal with lids and rings. Process in boiling water bath for 10 minutes. Remove from canner and allow to cool. Makes approximately 7 half pints. We have just discovered pepper jelly– and this one is such a beautiful color!! fun recipe!